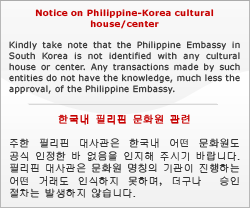 The Philippine Embassy in Seoul wishes to invite Filipino migrants in South Korea to attend the FilWHEL Health Education Program on 09 December 2018, Sunday, 2:00pm to 5:00pm to be held at the Rizal Hall of the Philippine Embassy. Registration starts at 1:30pm. 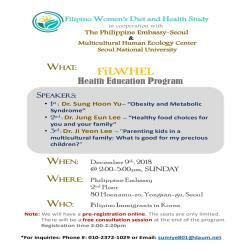 The seminar, organized by the Filipino Women's Diet and Health Study (FilWHEL) in cooperation with the Philippine Embassy and the Multicultural Human Ecology Center of the Seoul National University, will gather together experts to tackle challenges on obesity, nutrition, and parenting facing multicultural families. A free consultation session will also be held at the end of the program. Please be advised that due to the limited capacity of the venue, the seminar will only accommodate a limited number of participants.